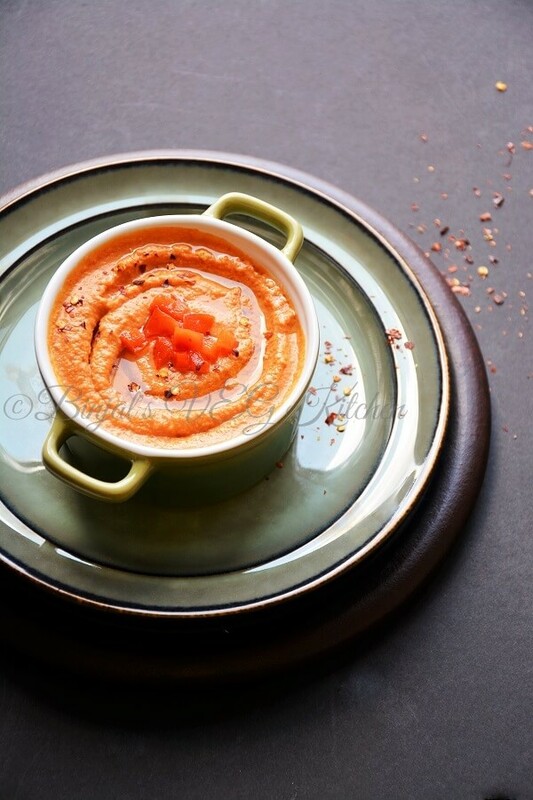 Roasted Red Pepper Hummus is one of the very popular Hummus version. Try this simple and creamy Roasted Red Pepper Hummus recipe with sweet red bell peppers, chickpeas, garlic and tahini. This Roasted Red Pepper Hummus is over the top delicious! It is full of that irresistible freshly roasted red bell pepper smoky flavor and creamy texture. Hummus is an Arabic word meaning “chickpeas,” and the complete name of the prepared spread in Arabic is “hummus bi tahina”, which means “chickpeas with tahini”. It is popular throughout the Middle East (including Turkey), North Africa (including Morocco), and in Middle Eastern cuisine around the globe. As an appetizer and dip, hummus is scooped with flatbread, such as pita. It is also served as part of a meze or as an accompaniment to falafel. There are so many version available, this is one of them. 1. Roast red peppers over the flame till all sides becomes black, or you can roast it into an oven on broil for 10-15 minutes. 2. Let it be cool down. Once it cooled, peel the black skin of pepper’s, discard the seeds and chop roughly. 3. 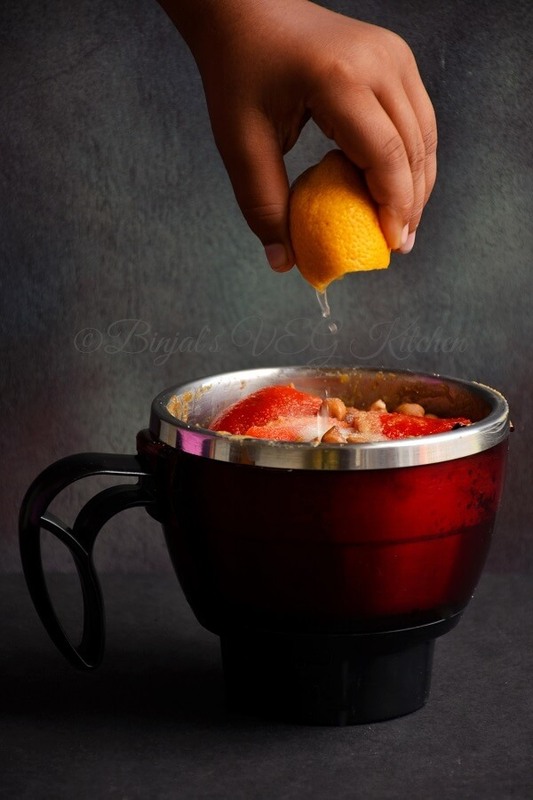 Add roast red peppers, chickpeas, homemade tahini, salt, olive oil, lemon juice, chili powder, cumin powder, garlic into a blender and blend it till smooth paste. 4. Roasted red bell pepper hummus is ready serve with chips, cracker as a dip. 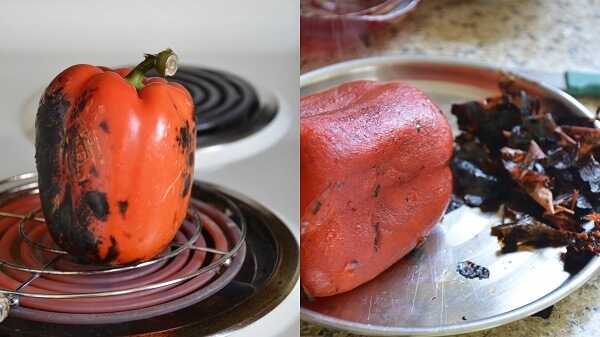 Roast red peppers over the flame till all sides becomes black, or you can roast it into an oven on broil for 10-15 minutes. Let it be cool down. Once it cooled, peel the black skin of pepper’s, discard the seeds and chop roughly. Add roast red peppers, chickpeas, homemade tahini, salt, olive oil, lemon juice, chili powder, cumin powder, garlic into a blender and blend it till smooth paste. 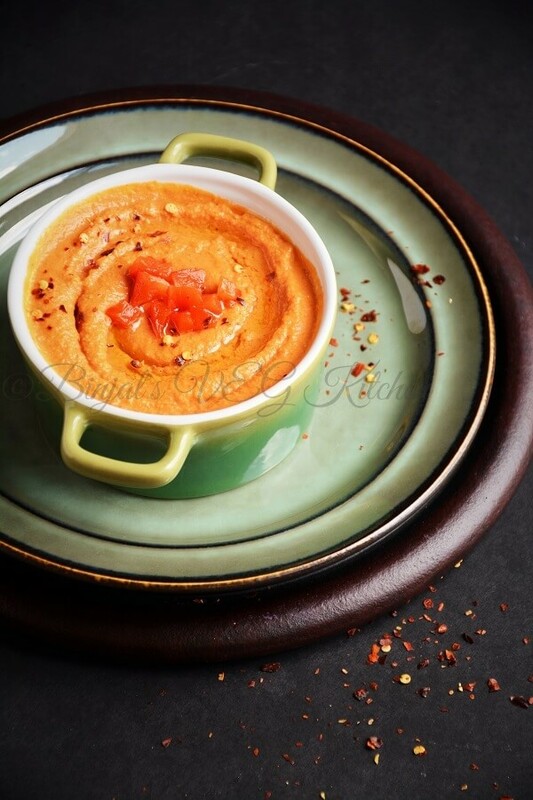 Roasted red bell pepper hummus is ready serve with chips, cracker as a dip.